1. What are your pathway preliminary theory of change, vision scenario, method of approach, concepts? View, browse CMU CREATE LAB & HCII work. Prepare to critique, compare, contrast with other advanced research in interaction design. Prepare to discuss how CREATE and HCII work might advance, amplify, accelerate, scale innovation in your PGH2050 scenario. In previous classes, we have referred to a number of future scenario maps for two reasons; first, to familiarize students with this aspect of future studies and second so that teams can incorporate global developmental goals into their PGH 3.0 scenarios. If METROPOLITAN REGIONS are the engine of innovation, economic opportunity, education, cultural development, innovation, technology and positive change, then global goals, if they are to be achieved, must be reflected in the strategic development plans of individual metropolitan regions. So it is with PGH 3.0. As teams now proceed to develop their DEXIGN THE FUTURE (DXF) SCENARIOS, we want to focus in on a few GLOBAL SCENARIO maps to use as a source of TOPSIGHT/BIG PICTURE MEGATRENDS and GOAL SET to backdrop your local PGH3.0 scenarios. As a model for this method of approach, see p. 13, Methodology, of the GREEN DENMARK 2050 SCENARIOS document. 2050 GREEN DENMARK SCENARIOS Note that the local Denmark scenarios are based on a number of broad, global future scenarios. Also note the diagram of the FUTURE SCENARIOS METHODOLOGY. We are using this same methodology in our DXF course; i.e. : casting up a NORMATIVE (i.e. : the feasible future we want) vision for life in PGH 3.0. Then we will “Backcast” to the present, hypothesizing the decade by decade milestones required to reach that future and identifying the present day EARLY SIGNALS/FUTURE SIGNS that point toward that future (“The Future Already Here”). GREEN DENMARK’s scenarios pursue four FOCUS AREAS as most significant in the transition to a green society; i.e: CITIES, BUILDINGS, THE COUNTRY and TRANSPORT. 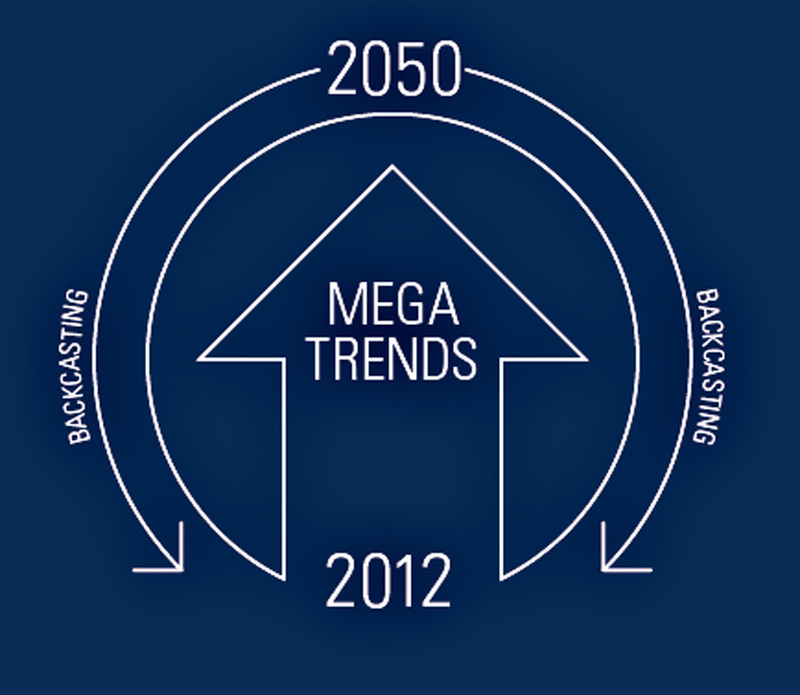 These focus areas in turn are based on four GLOBAL MEGATRENDS; i.e. : URBANISATION, POPULATION DEVELOPMENTS, ECONOMIC GROWTH and ENVIRONMENTAL CHALLENGES. Following this model, our DXF teams have chosen three PGH LOCAL FOCUS AREAS: LEARNPGH, SHAREPGH and DESIGN/LIVE/WORK(?)PGH. Within these focus areas, teams will develop FORESIGHT vision scenarios using PERSONA-BASED NARRATIVES. At the same time, teams will re-review FUTURE SCENARIO maps from various international organizations, noting the GLOBAL MEGATREND/PATHWAY GOAL SETS of these scenarios. From these goals, teams will select a super-set of their own GLOBAL MEGATREND/PATHWAY GOALS to serve as backdrop reference for their own FOCUS AREA SCENARIOS. Teams should feel free to add METATREND/PATHWAY GOALS you do not find in existing global scenarios that they feel are salient for your own PGH FOCUS AREA GOAL SET. 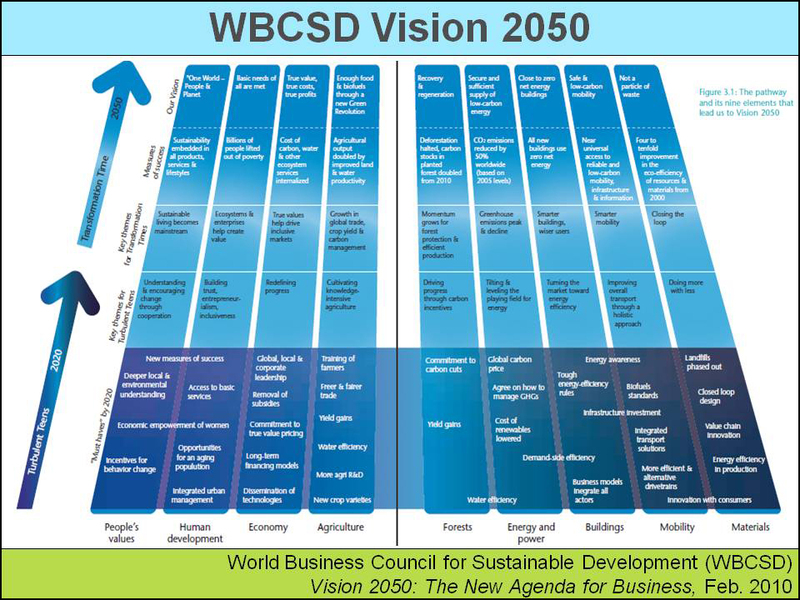 Some of these organizations, like WBCSD, are sponsored by corporations. Many, like the European Centre on Sustainable Production and Consumption (CSCP) are intergovernmental consortia. Others, like the World Economic Forum (WEF) are cross-sector Non-Governmental Organizations (NGOs) (business, political, academic, etc.). Still others are sector-specific, like the New Media Consortium (NMC). And there are many futures think tanks like Global Business Network (GBN) and Institute For the Future (IFTF). Most of the GOAL SETS overlap from one organization to the next, with sector-specific differences.